Plastic and Rubber Institute of Sri Lanka (PRISL) together with Enterprising Fairs (India) Pvt. Ltd, plan on having a rubber related exhibition on September 12, 13, 14, 2013 in Colombo. After the success of PLASTEXPO in August this year Enterprising Fairs had come forward to hold RUBEXPO providing a platform for local rubber related companies to participate and experience the new technologies and talent available in local and foreign market. Most of the people in the rubber sector cannot get first hand experience through international expertise and the exhibition would be a good opportunity. “We hope to have over 100 exhibitors both local and international, they will exhibit under categories of rubber products, materials and machines, it will also contain educational programmes that will be of great importance to its visitors. Swarminathan said that he is confident that RUBEXPO will be a success as it is a land of opportunities, thus with the infusion of the latest technology the country will be able to reach its target of increasing production to 200,000 MTs by 2020 and thus be able to achieve the US $ 5 billion mark in 2023. “We see that Sri Lanka has a great potential to increase export value,” he said. Secretary of the Ministry of Industry and Commerce, Anura Siriwardena, said Sri Lanka, presently is the sixth largest exporter of rubber to which 20 % is raw rubber. 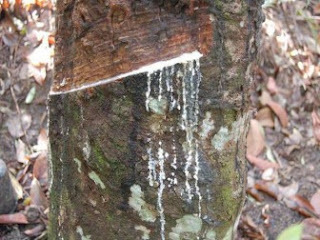 It is also the eight largest natural rubber producing country producing over 150,000 MTs rubber annually. The future holds bright for the rubber industry, according to Siriwardena as the ministry plans on expanding rubber cultivation in non traditional plantation areas, while introducing modern technology for processing as well as giving access to export markets for auto industries in neighboring countries through joint ventures.